There is a special tag for dinosaur images that are anatomically inaccurate! Wikipedia is the best example of what the ‘wisdom of crowds’ can achieve, although it is not without its detractors. To get an overview of the pros and cons, read the Wikipedia page about Wikipedia itself, and some of the pages linked to from it. Wikipedia is often criticized as inaccurate or unreliable, but it is in fact one of the biggest sources of factual information online, and studies have shown that in many cases its accuracy compares favourably to other established online encyclopedias (see Nature’s article ‘Internet encyclopedias go head to head’). Even controversial Wikipedia articles can offer an excellent picture of the controversy itself via an article’s discussion page. Like any encyclopedia, Wikipedia articles can be a great starting point for research. Many of you will already be familiar with Wikipedia itself and how to find information, but it pays to explore some of the article elements a bit further. Start by looking up some things that interest you; see what Wikipedia says. One of the most useful elements of Wikipedia is its strong citation policy. Look at the references linked at the bottom of the page – whatever the merits of the Wikipedia article itself, this can be a good starting point for research elsewhere on the web. 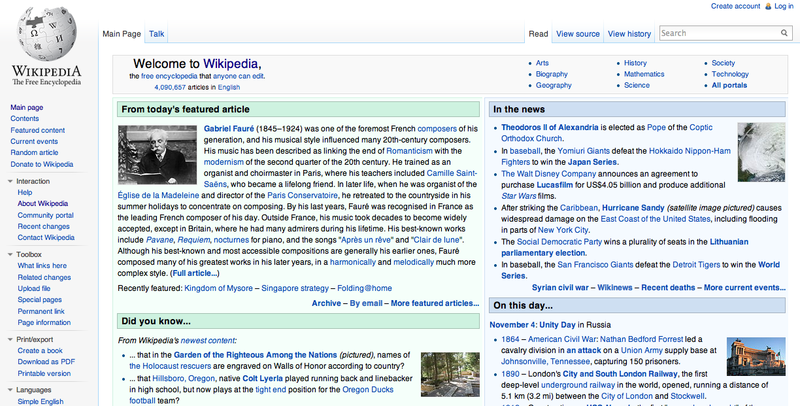 Many people are unaware of the ‘history’ tab (top right) and ‘talk’ tab (top left) for Wikipedia articles. These can make very interesting reading, particularly for controversial articles or subjects where there are strong opposing viewpoints, as you can see how the current version (and consensus) has been reached. Here, readers can suggest changes that they think should be made and argue their points; the discussion can get very in-depth and occasionally heated! Take a look at the discussion for a few articles. Wikipedia is only as good as its authors, and we encourage you to give editing a Wikipedia page a try. It’s easier than you might think! Although you don’t have to have an account, we’d encourage you to set one up as it allows you to participate in discussions more easily and, though it may seem counterintuitive, allows you more anonymity (you can operate under a pseudonym with an account, but an anonymous edit records your IP address). Take a look at the Public Library of Science’s ‘Ten Simple Rules for Editing Wikipedia’ before you get started, and use Wikipedia’s markup cheat sheet as a guide. Just one caveat: Do keep in mind that you’re not generally encouraged to edit information about your own company or organisation, as it may present a conflict of interest. If you’re worried about this, take a look at how the US National Archives have turned Wikipedia into a positive tool while avoiding these conflicts. What are your thoughts on Wikipedia as a source of information? Do you think it is reliable? Do you think that having the information on the history and talk pages available adds to your understanding of page topics? Tag your post Thing 14. This entry was posted in Thing 14 by Alasdair Watson. Bookmark the permalink. The world behind WIKIpeddia has been a real surprise. I never thought for a minute that it was it’s own little ecosystem. The 5 tenants for writing and editing articles have adaptability for all writing for the Internet too. I was surprised by some of their policies – the majority opinion versus the minority facts for example. Weird. Confirmed my belief that the beast shouldn’t be completely trusted. Very interesting to seek how its been kidnapped for other purposes – like making money! – too.